Qualche ora fa il Nintendo eShop ha rivelato la data di uscita di Case Closed Skateboard Run: Phantom Thief Kid and the Mysterious Treasure su Nintendo Switch. 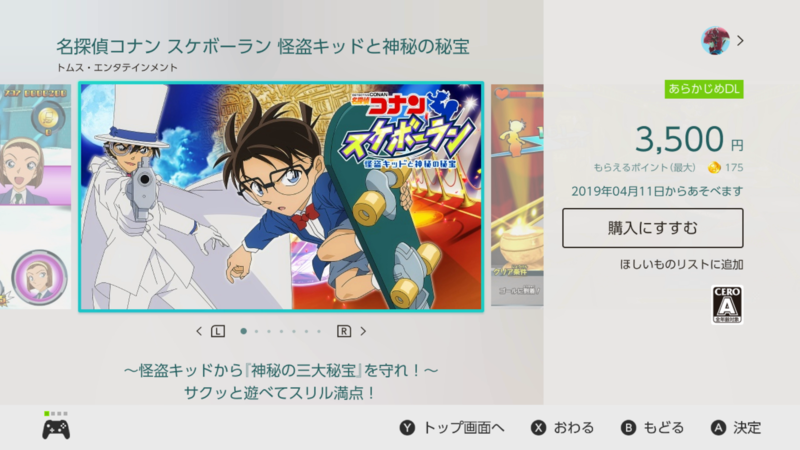 Il nuovo titolo dedicato al celebre detective rimpicciolito (Shinichi Kudo/Conan Edogawa), sarà disponibile grazie alla pubblicazione di TMS Entertainment, il prossimo 11 aprile 2019 sull’eShop giapponese di Nintendo Switch, al prezzo di 3,500 yen. Potete trovare informazioni sul titolo e il trailer, in calce all’articolo. Ten or so centuries ago, there were three civilizations that secretely flourished in the world. Those civilizations produced the magnificent and very rare “Three Great Mysterious Treasures.” And even though those civilizations fell, the treasures were still somewhere on their land. Present day. As the world watches, the Suzuki Financial Group, having managed to acquire the treasures, builds a giant theme park based on those three civilizations. But just as the park is about to open, Jirokichi Suzuki receives a calling card announcing that the Phantom Thief Kid will steal the treasures. 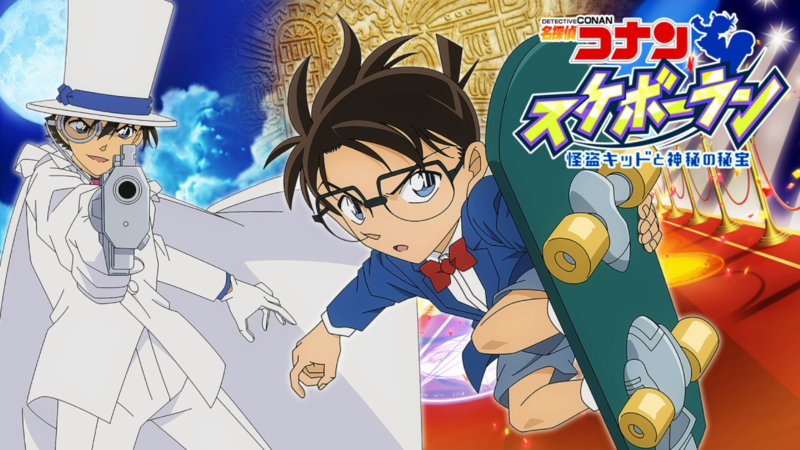 In order to stop the Phantom Thief Kid’s criminal act, Conan hurries to the treasure! There is plenty of danger to watch out for on the game’s courses! Jump and lean to avoid obstacles while aiming for the final stages of the three areas (Subtropical Marine Park, Ancient Ruins, and Ice Shrine) where the treasures were on display. The Phantom Thief Kid will suddenly appear during your runs and use dangerous magic to obstruct your path forward! Online Rankings – Compete against players’ high scores around the country! Missions – Take on various missions for each stage.